Context: Telemedicine is a major effort to tackle the uneven availability of facilities for thrombolysis in acute ischemic stroke. We present a telestroke model introduced in a small hilly state of Himachal Pradesh in India. Aims: To provide acute ischemic stroke treatment with tissue plasminogen activator in all district hospitals of Himachal Pradesh with computerized axial tomographic scan facility through Telemedicine. Settings and Design: Smartphone-based hub and spoke telestroke model was used with two tertiary care hospitals (with neurologists) as hub and 17 district hospitals (without onsite neurologists) as spokes. Subject and Methods: The telestroke project was launched in the state of Himachal Pradesh in April 2014. Medical officers in district hospitals (Medicine graduates and Internal Medicine postgraduates) were trained in the treatment of stroke through workshops. Tissue plasminogen activator was made available at all these centers, free of cost through hospital pharmacies. Four neurologists at two tertiary care centers were made available for consultation on phone. 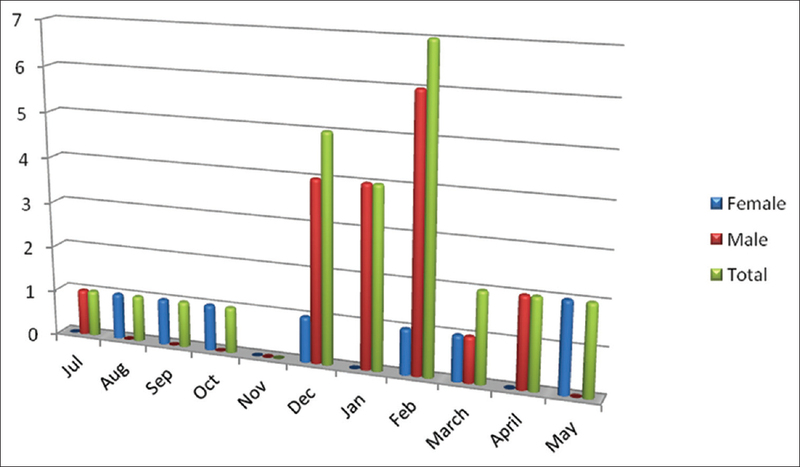 Results: Between June 2014 and May 2015, a total of 26 patients received thrombolysis under the telestroke project at nine district hospitals without onsite presence of a neurologist. Eight patients were females and 18 males. The age of patients ranged from 26 to 80 years. Only 2 patients developed an intracranial bleed following thrombolysis, and both were nonfatal. Conclusions: Smartphone-based telestroke services may be a much cheaper alternative to video-conferencing-based telestroke services and are more portable with less technical glitches. To the best of our knowledge, this is the first telestroke model being reported from India. It seems to be the way forward in providing timely treatment in acute ischemic stroke in underserved and resource poor settings. Treatment of acute ischemic stroke (AIS) has seen remarkable advances in the last two decades. Early treatment of AIS within 4.5 h with intravenous tissue plasminogen activator (tPA) reduces neurological impairment and disability.,, The earlier it is administered, the better is the effect and the lower is the rate of hemorrhagic complications. Therefore, thrombolysis has become the cornerstone of AIS therapy; however, its widespread use is hindered by a number of obstacles, the most restrictive of which is the narrow therapeutic time window. It is due to this reason that even in countries with the best health care settings and favorable neurologist: population ratio, less than 5% of patients with ischemic strokes receive thrombolysis. Yet, thrombolysis with tPA is at present the best available treatment for AIS. While awaiting new therapies, implementing the administration of intravenous thrombolysis in a larger proportion of AIS patients is a major challenge. Telemedicine enables a medical consultation to occur when the physician and the patient are in different locations. It is a major effort to tackle the uneven availability of facilities for thrombolysis in AIS. There is sufficient evidence to suggest that thrombolysis, when given using telestroke consultation, is as safe and effective as when it is given in a stroke center, and there are specific American Heart Association/American Stroke Association statements detailing the evidence for its use along with guidelines for its implementation.,, The term “telestroke” has been defined as “live, audio-video telecommunication applied to the care of acute stroke.” Telemedicine for stroke management is a level 1, class A recommendation when a vascular neurologist is absent. However, current telestroke networks require exorbitant startup costs, which are prohibitive for the resource poor countries in which they are needed the most. To deliver this treatment in resource poor settings, therefore, becomes all the more challenging. Telemedicine in AIS has been practiced by a number of technological devices that are less sophisticated than video-conferencing, including telephones, multimedia messaging service, email, or some combination methods. Furthermore, it has been demonstrated that high-quality telestroke consultations can be performed with mobile computers and smartphones ,,, enhancing the portability of the service. The disease burden of stroke in India is very large with more than 1.5 million stroke cases per year. The costs involved in caring for residual disabilities such as physical dependence, cognitive decline, depression, and seizures in addition to the costs of stroke care are enormous and have adverse social implications. A prompt affirmative action is imperative to prevent this cascading disease burden in the Indian society. Stroke mortality rate in India is 22 times that of malaria and 1.4 times that of tuberculosis (Indian Council of Medical Research census). The small number of neurologists present in India implies that most stroke care will have to be provided by other physicians and health care providers. These factors impede access to acute care and ongoing follow-up for primary and secondary prevention. Telestroke facilities through telemedicine seem to be the “promise,” which has the potential to optimize stroke care across all strata, bridging the economic and geographic barriers in the country. Significant proportion of patients in remote locations could be successfully managed locally with advice/guidance from specialists/superspecialists in the cities without having to travel to reach the specialists in person. Telestroke facilities can make modern healthcare available and accessible to remote areas using information technology. Telestroke can also play a significant role in training medical personnel across the country. Decrease in the price and complexity of this technology over the last decade has made it economically viable for India. Telestroke can serve to address the problems of both insufficient numbers of stroke specialists as well as the narrow therapeutic time range for treatment with recombinant tissue plasminogen activator (rTPA). The diagnosis of stroke can be made expediently and remotely. Telestroke offers the promise to more consistently apply protocols and improve efficiency of stroke care. In essence, it would allow patients in more remote areas a chance for procuring comprehensive stroke care. With this background, the government of Himachal Pradesh initiated the Himachal Pradesh (HP) model of telestroke in March 2014; the 1 year experience with the model is described below. 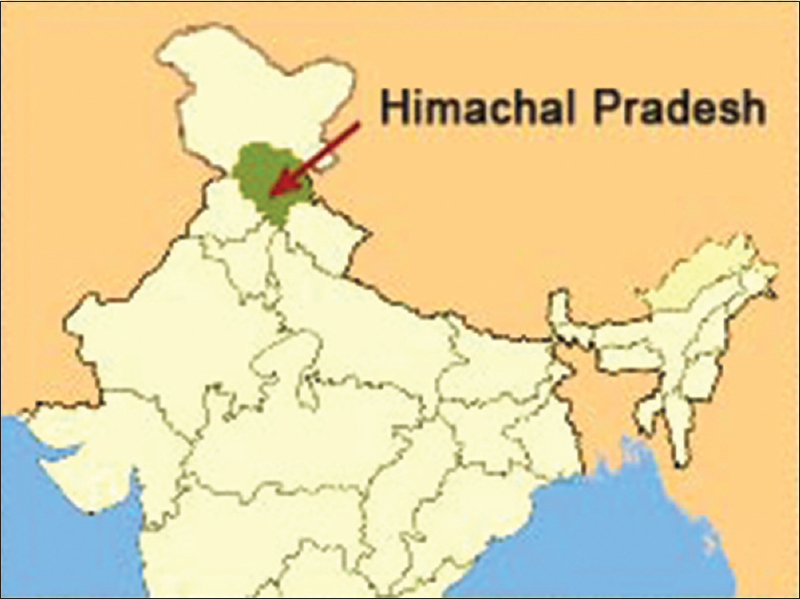 Himachal Pradesh is a small hilly state in the Northern part of India [Figure 1]. Covering an area of 55,673 km (34,594 mi), it is a mountainous state. It has a population of 6,856,509 with a population density of 123/km 2, 90% of the population lives in villages, as per the provisional results of the Census of India 2011. It has 12 districts. The population in the respective districts ranges from 32000 to 1.5 crore. It has two tertiary care hospitals with four neurologists, two in each hospital. Hence, given the difficult terrain and only four neurologists residing in that area, delivering stroke treatment seemed like a distant dream. However, in March 2014, under the guidance of Stroke Specialists from the All India Institute of Medical Sciences, New Delhi and on the initiative of Secretary of Health, Himachal Pradesh, a Telestroke Project was envisaged. All the government hospitals with computed tomographic (CT) scan facility were roped in. Out of 17 such hospitals, eight and nine centers, respectively, were attached to each of the two tertiary care centers [Figure 2]. Workshops were conducted at various district hospitals. Medical officers in these hospitals (Medicine graduates and Internal Medicine postgraduates) were trained in recognizing stroke through these workshops. They were taught to read plain CT scan of the head to rule out hemorrhage even without the help of a radiologist and written protocols for thrombolysis in ischemic stroke with explicit inclusion and exclusion criteria were provided. Blood sugar and electrocardiogram (ECG) were the only other investigations performed apart from the CT scan of the head, before the institution of thrombolysis. tPA was made available at all these centers and was provided free of cost through the hospital pharmacies. All the four neurologists were made available on phone 24 × 7, and whenever any patient suffering from ischemic stroke came in the window period, they were contacted. It was decided to use the social networking sites such as “WhatsApp” for transmitting CT scan images to neurologists for consultation. These hospitals were then designated as primary stroke centers. Without any additional infrastructure requirement or any new manpower, the project was finally launched in May-June 2014 amid much skepticism regarding its success. Within 1 month, for the first time in the state, a patient of AIS was successfully thrombolyzed at a district hospital without onsite presence of a neurologist. A 75-year-old male who had presented within 40 min of developing a right hemiparesis with a power of 1/5 in the right upper limb and 3/5 in the right lower limb was given tPA after exclusion of hemorrhage with the door-to-needle time of 40 min. At discharge, he had a power of 3/5 in the upper limb and 5/5 in the lower limb. The successful management of this patient proved the feasibility of the telestroke project and then there was no looking back. 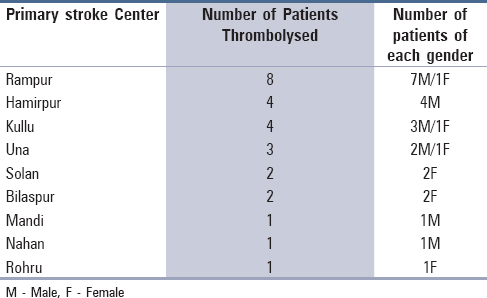 Till May 2015, a total of 26 patients had received thrombolysis under the telestroke project at the primary stroke centers [Table 1]. Eight patients were female and 18 were males [Figure 3]. The age of the patients ranged from 26 to 80 years. Only 2 patients developed intracranial hemorrhage following their thrombolysis, both of which were nonfatal, and there was no acute in-hospital mortality. 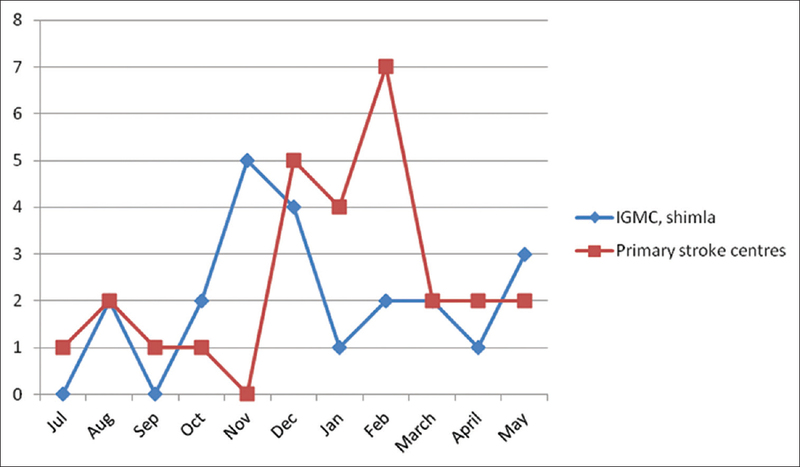 During the same period in Indira Gandhi Medical College (IGMC) at Shimla, which is the biggest tertiary care center of Himachal Pradesh, 22 patients received thrombolysis [Figure 4]. This showed that the primary stroke centers provided treatment to more AIS patients and the difference is bound to widen even more in the future [Figure 5]. All this has been achieved without any additional infrastructure and manpower. All the patients at primary stroke centers were thrombolyzed by physicians (Internal Medicine postgraduates), and in centers where physicians were not posted, no thrombolysis was reported. A 42-year-old male presented at the district hospital Kullu (about 220 km from IGMC, Shimla, a journey of approximately 7 h by road) with the history of weakness of the right side of body of 1 h duration at 16.00 h. At presentation, he had right facial weakness with 0/5 power in the right upper limb and 2/5 in the right lower limb. There was no speech or sensory involvement. His National Institutes of Health Stroke Scale (NIHSS) score was 10. His blood pressure was 136/84 mmHg and blood sugar was 87 mg/dl. His electrocardiogram (ECG) was normal. His noncontrast CT scan of the head was done at 16:24 h, and the neurologist at IGMC, Shimla was contacted on the phone. 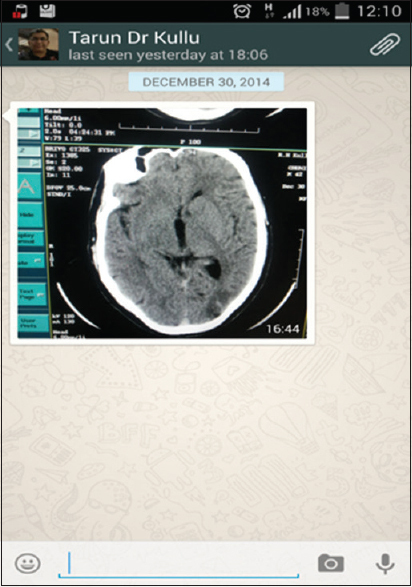 The CT scan head images were sent via WhatsApp at 16:44 h [Figure 6]. It showed hypodensity in the left occipital region suggestive more of a sequel of a chronic infarct than a fresh lesion. The site of lesion also did not clinically correlate with the neurological deficit. The opinion of the neuroradiologist at IGMC was also taken by showing him the WhatsApp images and he, too, was of the same opinion. The neurologist finally gave a 'go ahead' for the procedure of thrombolysis at17:05 h and the patient was thrombolyzed with 50 mg of tPA. Twenty four hours later, he had 2/5 power in the upper limb and 4/5 in the lower limb with a NIHSS of 6. At 1 month follow-up, he had a modified Rankin Score of 2 with mild facial weakness persisting. The stroke care scenario is grim in India with one neurologist for 3,200,000 population in 1998, and one neurologist for 1,250,000 people, as per the 2008 estimate. There is a need to explore alternative options to tackle the rising burden of stroke. With less than 1500 neurologists for a billion plus population, acute stroke care will remain an unfulfilled quest unless it is also delegated to physicians and even medicine postgraduate students. The challenge, therefore, lies in turning all physicians and medical postgraduate students into stroke physicians. Telemedicine offers a ray of hope in widening the reach of stroke care without compromising on quality. It can be helpful not only in the management of the usual atherothrombotic and embolic strokes but also in the diagnosis and treatment of unusual strokes which comprise 6% of all cerebral infarctions. Telemedicine is currently being used in India for diagnosing stroke patients, subtyping stroke as ischemic or hemorrhagic, and in treating the patient accordingly. However, a dedicated telestroke system for providing acute stroke care is needed and remains a formidable task with the currently prevalent poor resources and manpower. To the best of our knowledge, this is the first published smartphone-based experience of telemedicine in acute stroke care in India. As the objective was to demonstrate its feasibility, there was less emphasis on data collection regarding stroke performance indicators such as door-to-CT scan time and door-to-needle time. Now that its feasibility has been demonstrated, the next step would be to apply various protocols measuring the stroke performance indicators to document its efficiency. Telemedicine in stroke is highly underutilized at present in India while the world has moved on to concepts such as stroke emergency mobile unit., With ever improving technology, smartphone-based telestroke services may not only be a much cheaper alternative to video-conferencing-based telestroke services but also be more portable, equally efficient, and with less technical glitches. It seems to be the way forward in providing timely treatment in AIS in under-served and resource-poor settings. What are the anticipated barriers for establishing/functioning of telestroke in India? Education: Existing scenario reveals large areas in geographic isolation wherein educational and awareness programs are nonexistent. Upgrade the existing emergency medical services with swift, well-equipped and adequate number of ambulances with sophisticated telecommunications equipment mounted on them. Demonstration of pilot projects for proof of principle in the development of spoke sites. Adequate appropriation of funds for stroke and cardiovascular disease research by apex governmental scientific agencies and public–private partnerships as well as philanthropic organizations. Funds for initiation, development, and maintenance of telestroke programs to be allocated in the National Health Plans. Develop user-friendly national legislation for licenses, compliance, liability, and privacy issues for telestroke services. Implement community education and awareness programs. Physician education is required for acute stroke diagnosis, treatment, prevention, and rehabilitation. Research recommendations: Conduct education at remote sites (cessation of smoking, diabetes and hypertension prevention and control, nutritional education, etc. ); evaluate feasibility of transient ischemic attack/secondary stroke prevention clinics at remote sites. Assess acute stroke treatment using telestroke. Assess quality measures. The disease burden of stroke in India is very large with more than 1.5 million stroke cases per year. The costs involved in caring for residual disabilities such as physical dependence, cognitive decline, depression, and seizures, in addition to costs of stroke care, are enormous and have adverse social implications. India is characterized by low penetration of healthcare services. The rural and remote areas continue to suffer from absence of quality healthcare. Telestroke facilities through telemedicine seem to be the “promise,” which has the potential to optimize stroke care across all strata, bridging the economic and geographic barriers in the country. Telestroke can also play a significant role in training medical personnel across the country. The decrease in the cost and the complexity of this technology over the last decade makes it economically viable for India. Telestroke offers the promise to more consistently apply protocols and improve efficiency of stroke care. 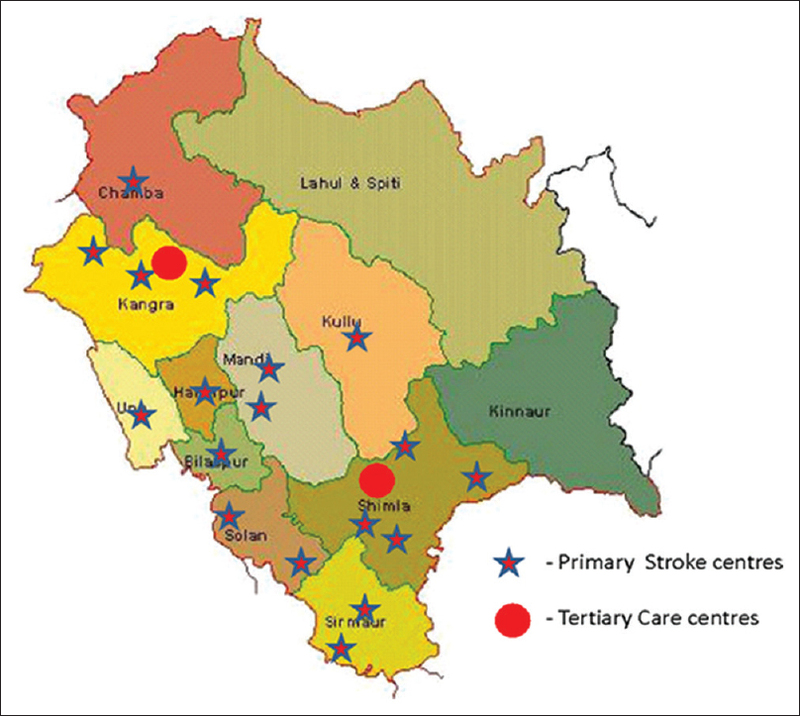 In essence, it would give patients staying in remote areas a chance for obtaining comprehensive stroke care. Department of Health and Family Welfare, Himachal Pradesh. Hacke W, Donnan G, Fieschi C, Kaste M, von Kummer R, Broderick JP, et al. Association of outcome with early stroke treatment: Pooled analysis of ATLANTIS, ECASS, and NINDS rt-PA stroke trials. Lancet 2004;363:768-74. Allen NB, Kaltenbach L, Goldstein LB, Olson DM, Smith EE, Peterson ED, et al. Regional variation in recommended treatments for ischemic stroke and TIA: Get with the Guidelines-Stroke 2003-2010. Stroke 2012;43:1858-64. Schwamm LH, Holloway RG, Amarenco P, Audebert HJ, Bakas T, Chumbler NR, et al. A review of the evidence for the use of telemedicine within stroke systems of care: A scientific statement from the American Heart Association/American Stroke Association. Stroke 2009;40:2616-34. Schwamm LH, Audebert HJ, Amarenco P, Chumbler NR, Frankel MR, George MG, et al. Recommendations for the implementation of telemedicine within stroke systems of care: A policy statement from the American Heart Association. Stroke 2009;40:2635-60. Rubin MN, Demaerschalk BM. The use of telemedicine in the management of acute stroke. Neurosurg Focus 2014;36:E4. Frey JL, Jahnke HK, Goslar PW, Partovi S, Flaster MS. tPA by telephone: Extending the benefits of a comprehensive stroke center. Neurology 2005;64:154-6. Singh R, Ng WH, Lee KE, Wang E, Ng I, Lee WL. Telemedicine in emergency neurological service provision in Singapore: Using technology to overcome limitations. Telemed J E Health 2009;15:560-5. Audebert HJ, Boy S, Jankovits R, Pilz P, Klucken J, Fehm NP, et al. Is mobile teleconsulting equivalent to hospital-based telestroke services? Stroke 2008;39:3427-30. Gonzalez MA, Hanna N, Rodrigo ME, Satler LF, Waksman R. Reliability of prehospital real-time cellular video phone in assessing the simplified National Institutes of Health Stroke Scale in patients with acute stroke: A novel telemedicine technology. Stroke 2011;42:1522-7. Demaerschalk BM, Vegunta S, Vargas BB, Wu Q, Channer DD, Hentz JG. Reliability of real-time video smartphone for assessing National Institutes of Health Stroke Scale scores in acute stroke patients. Stroke 2012;43:3271-7. Anderson ER, Smith B, Ido M, Frankel M. Remote assessment of stroke using the iPhone 4. J Stroke Cerebrovasc Dis 2013;22:340-4. Murthy JM. 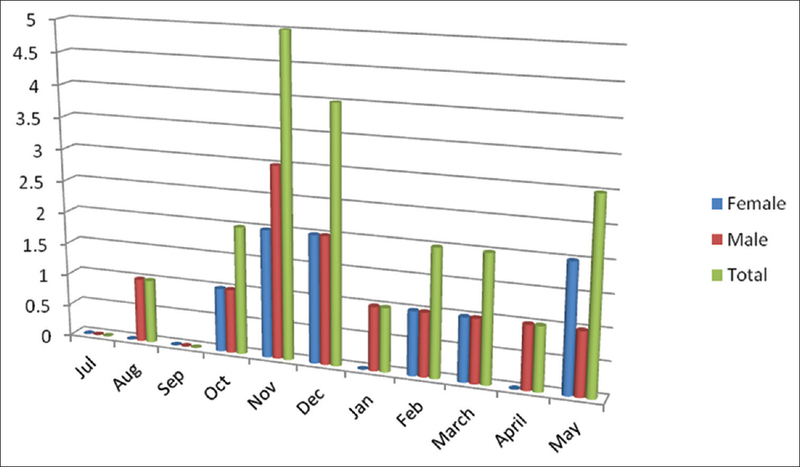 Thrombolysis for stroke in India: Miles to go. Neurol India 2007;55:3-5. Gourie-Devi M. Organization of neurology services in India: Unmet needs and the way forward. Neurol India 2008;56:4-12. Arboix A, Bechich S, Oliveres M, Garcia-Eroles L, Massons J, Targa C. Ischemic stroke of unusual cause: Clinical features, etiology and outcome. Eur J Neurol 2001;8:133-9. Srivastava PV, Sudhan P, Khurana D, Bhatia R, Kaul S, Sylaja PN, et al. Telestroke a viable option to improve stroke care in India. Int J Stroke 2014;9 Suppl A100:133-4. Meyer BC, Raman R, Hemmen T, Obler R, Zivin JA, Rao R, et al. Efficacy of site-independent telemedicine in the STRokE DOC trial: A randomised, blinded, prospective study. Lancet Neurol 2008;7:787-95. Demaerschalk BM, Bobrow BJ, Raman R, Kiernan TE, Aguilar MI, Ingall TJ, et al. Stroke team remote evaluation using a digital observation camera in Arizona: The initial Mayo Clinic experience trial. Stroke 2010;41:1251-8. Demaerschalk BM, Raman R, Ernstrom K, Meyer BC. Efficacy of telemedicine for stroke: Pooled analysis of the Stroke Team Remote Evaluation Using a Digital Observation Camera (STRokE DOC) and STRokE DOC Arizona telestroke trials. Telemed J E Health 2012;18:230-7. Demaerschalk BM, Vargas JE, Channer DD, Noble BN, Kiernan TE, Gleason EA, et al. Smartphone teleradiology application is successfully incorporated into a telestroke network environment. Stroke 2012;43:3098-101. Misra UK, Kalita J, Mishra SK, Yadav RK. Telemedicine in neurology: Underutilized potential. Neurol India 2005;53:27-31. Renjen PN, Chaudhari D. Telemedicine and stroke: Stroke emergency mobile unit – A new approach to stroke care. Neurol India 2016;64 Suppl: S110-2.